President Donald Trump holds up an executive order he signed at the Pentagon, where James Mattis, right, was also sworn in as defense secretary, in Arlington, Va., Jan. 27, 2017. 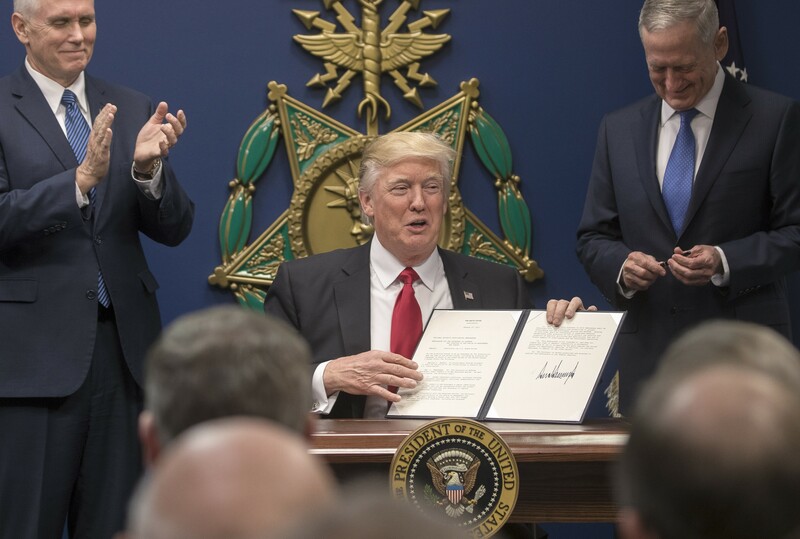 Trump signed orders related to military spending and the vetting of immigrants. At left is Vice President Mike Pence. Trump made the surprise declaration in a series of posts on Twitter, saying he had come to the decision after consulting with generals and military experts, whom he did not name. The president’s announcement came amid debate on Capitol Hill over the Obama-era practice of requiring the Pentagon to pay for medical treatment related to gender transition. The dispute has unfolded as Congress considers a nearly $700 billion spending bill to fund the Pentagon. Rep. Vicky Hartzler, R-Mo., has proposed an amendment that would bar the Pentagon from spending money on transition surgery or related hormone therapy.